I believe there's a culinary answer to almost all of life’s problems. I’m not talking federal deficit, Af-Pak, bed-bugs-taking-over-Manhattan (or at least expensive suitcase stores within) problems. More like, I don’t like my office chair, my 11-year-old just told me she “hates living here and there is zero chance it will get better” and as it turns out I’m out of dish soap and I just glanced up and saw a mouse run across my kitchen floor sort of problems. The sort that really have no practical solution, nor legislative response. The sort you eat through. For some, comfort might rest in the form of warm, crusty bread. Others take their peace from macaroni, or Mughlai biryani. High or low is of no consequence, or at least a highly flexible construct: a friend who has dined at all of the best restaurants in New York is a sucker for microwavable chicken wings; the aforementioned 11-year-old is as addicted to Humboldt Fog cheese and Utz salt-and-vinegar chips. Me, I like a nice steak. I love the ease of it, of course, especially at the end of a bad day. Further, I am inexplicably nuts for the smells and sounds of a nice piece of beef crackling inside my oven. Maybe it reminds me of childhood –- mom and dad were not great cooks but they did have a way with meat, seasoned with Morton salt and served on a chrome-and-glass coffee table in front of "The Bob Newhart Show." Or maybe it's because I know my Texan husband will always smile when his plate o’ steak is plopped before him, a small reward for living with the likes of me, who is prone to bouts of crying over the fact that I cannot find the blade of my mandoline. It seems that coffeefoodwritergirl is also moved with nostalgia whenever she makes Broiled New York Steak, a kind of recipe poem to her late father. Now many of you (except the vegetarians, who have already left me to go back to cutting up onions or thinking deep thoughts about acorn squash) are probably saying, "Um, Jenny I don’t need anyone to tell me how to make a good steak. Buy good meat, salt and pepper it up, salt it some more and don’t overcook it." Yes, you’re right, and that’s fine. But there is something special about the combination of garlic salt and dry mustard rubbed onto your meat, a little extra burst of complexity in the tender bites of a properly-cooked meal. I skipped the seasoning salt, because I don’t own any, and I think you can, too, but be sure to use just as much mustard as our author suggests to get the full effect. I made this twice and the first time used less pepper which I think is right; 4 teaspoons was bit much for my taste and overpowered the other flavors. Here is something else: this recipe worked even better on my less expensive New York strip steaks that I picked up at Trader Joe’s than the grass fed babies I purchased a week later. Does this simply mean fun seasoning can compensate for lesser steaks? Or that even our most intense investments in the flavor superiority of better meat is no match for the tang of mustard? I don’t know. I don’t care much either. I just know it worked for me. 1. Let the steaks come to room temperature (if cold) and heat the broiler. Make sure the rack is set so that the steaks are about 8 inches from the broiler. 2. Sprinkle 1/2 tablespoon powdered mustard on each side of each steak; press in. 3. 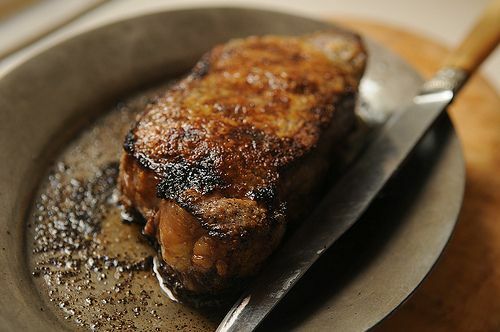 Sprinkle each side of steak with: 1/2 teaspoon powdered garlic; 1/2 teaspoon salt; 1/2 teaspoon seasoning salt and 1 teaspoon coarsely ground pepper. Press the spices into the meat. 4. Broil the steaks approximately 8-10 minutes per side for medium rare. Reduce the oven heat to 500 degrees. Set the steaks on the middle rack and let cook an additional 5-6 minutes. 5. Remove the steaks from the oven and let rest for 10 minutes; then slice on the diagonal and serve. Great with garlic green beans and mashed potatoes. I was as excited to try this recipe as I was disappointed in the result. My family agreed. I'm somewhat flummoxed as the other comments seem overwhelmingly positive. The mustard flavor was nowhere to be found. Worse, the garlic and salt were overpowering to the point of being unpalatable. The flavors were abrasive and completely masked the lovely strip streak. If I were to try this again, I'd experiment with using dijon or brown mustard as a coating with perhaps a little kosher salt and oil. Also, as someone noted above, the olive oil mentioned in the ingredients is not referenced in the instructions. To be fair, I deviated from the recipe in the following ways (none of which I can imagine would affect the result all that much). 1) My steaks were between 1 and 1.5 inches thick - a little under a pound each. 2) I omitted the seasoning salt. 3) I added the olive oil after pressing in the spices as described in step 3. 4) I cooked the steaks 5 minutes a side under a broiler about 3 inches away. I did not finish in the oven but let them rest sufficiently. They came out a perfect medium rare with a nice crust. i am sorry about your experience. i have made this a few times to different results. the best is if you use plenty of dry mustard and go lower on the garlic. you dont need seasoning salt. I'm with you on steak as comfort food. Regarding your rub working better on the TJ's vs. grass-fed steak, I've seen this a lot and it's likely due to a combination of factors rather than price point or grain-fed vs. grass-fed. As with wine, steaks and burgers from different farm/butcher teams have different flavors and textures due to differences in breed, growing region, specific diet, age, husbandry/pharmaceutical practices, and aging time and technique. Some rubs, side dishes, or wines will complement the flavors in one farm's meat and some will clash. It's pretty fun to experiment. YOUR MOUTH. JUST A PERFECT ADDITION TO ANY PARTY,AND SO EASY TO SERVE. When do you use the olive oil? you know, i TOTALLY read over that because it wasnt in the recipe instructions. i assume to secure the mustard mix. This is the easy win in our house, too. Pair this with your Gin Rickey and everything will be just fine! I feel a bit silly asking this, but are you placing the steak directly on the rack? Or do you have a pan as well? i did them on a foil lined sheet. Mmm. Comfort food. Yes, this is right up there with a perfectly roasted chicken. Or pork rinds. Hang in there, gang. In a couple more weeks, you can frolic in the snow when school is canceled and forget all your worries. her photos are the best. let me know how it turns out.